Welcome to the Faerie Abilities Guide! 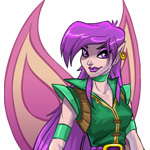 You will find all you need to know here about the new Faerie Abilities for The Battledome. This guide was created the day Faerie Abilities were re-introduced to the site and we were the first to begin testing & gather this information. Let me just say thank you to the select few users from The Battledome Chat who spent their time, money and effort helping to gather the initial information together. It would have never happened if it were not for everyone involved. This entire page has had a complete makeover so it is now easier to navigate and view. The navigation is on the left portion of the page. The first section has general information and in-depth guides about the new ability system, new faerie bottles, etc. You will then see the faerie abilities portion separated into each Tier Level so you can navigate to where you would like. If a portion of this page is cut off, zoom out (Control -) until you see the entire page. If you have any questions, concerns or comments, please feel free to neomail me, thank you & enjoy! Please Remember: This guide took many testers to find out this information and I wrote all of the guides & general information you see here myself. If you wish to use this information elsewhere, please neomail me to ask permission, thank you. 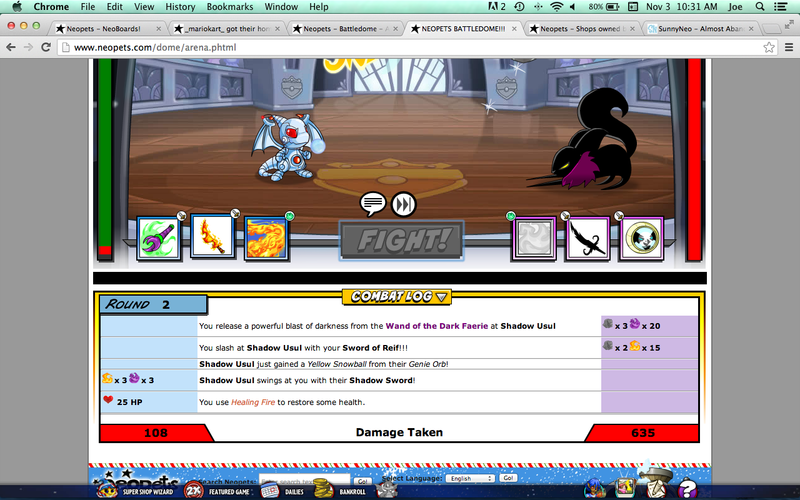 • Unfortunately there are no updates to report as nothing has been changed to Faerie Abilities or The Battledome...yet. Just want to update this to let everyone know this page is not forgotten about and once the Neopets Team brings updates, I will update this page. • Thank you formosoft for offering to revamp the entire layout of this page! • Please know that I am still willing to update information on this page; however, many abilities seems to slightly change for a period of time or act up. Until The Neopets Team confirms any intended changes, I will not alter what these abilities do. At the time of writing this, they have not intentionally changed faerie abilities in a long time. Many, many years ago, when The Battledome was first created, Faeries granted well trained pets certain abilities (depending on how advanced they were) and they became quite popular to use. As the years continued, it became mandatory to have certain abilities in order to aid in winning battledome challenges. These older abilities were unchanged for many years; however, until The Battledome was removed from Neopia. When The New Battledome was introduced to Neopia at the end of 2012 and beginning of 2013, it was only appropriate for the Faeries to do their part as well and re-vamp their abilities. Over the many years of training, pets have far surpassed their useful abilities and it was only right to challenge everyone once again. When the New Faerie Abilities were introduced, everyone was hectic, had tons of questions and was unsure of many things. Word spread quickly and even Neopians who were gone for a while returned. In order to help make everything clear and understandable, I created a little chart (click here to view or click "Meet the Faerie" on the navigation bar) to help guide you. These were around Neopia for over a decade until recently when they became retired and power fading. Their previous abilities were not very strong except for a small few which were used. With the recent changes, these bottles can no longer grant blessings for your pet; however, you are able to combine these bottles to create a Weak Bottled Faerie at random. These are the first new faerie bottles introduced to us for training purposes. These weak bottles will grant 1-2 blessings for the appropriate family. The unidentified bottle will grant 1-2 blessings from random faeries. These can be directly used on your pet via your inventory. Once you bless your pet, the faerie bottle will be removed from your inventory since they are one use item (like the previous bottles). • Randomly rewarded for completing Snow Faerie Quests. Once you have any newer bottled faeries in you possession, you can simply go to your inventory, click on the bottle, and "bless" the pet you want to train. Blessings are pet specific, not account specific. This means if you want two of your pets to have many abilities, you will have to pay individually for each one. If you do plan to transfer your pets in the future, do not worry about faerie blessings. Any abilities and unused blessings will be transfered with your pet. After blessing your pet, you are able to view your current blessings here. It will show you on the top right the amount of blessings for each faerie you currently possess. You will also see all of the abilities listed below broken down into ten Tier Levels. Each ability has an image with at least one or more icons next to it and a number. This states what it will cost you (in blessings) to obtain that ability. For example, in Tier Level 25 the ability Sear would cost ten fire blessings to learn. Please know that you are able to freely train between tiers as you do not need to start with Level 1 and move up. Another important factor to know is that you are only able to actively have one of the three abilities per tier. If you wish to switch within the tier, you will be required to pay half the original blessing amount (If you paid 10 blessings the first time, it will cost 5 blessings to switch). It will not go lower than this initial discount so try not to switch too much. Save Money: Remember that once you learn an ability in a Tier, all of the others will decrease in blessing requirements. This can come in handy since certain bottled faeries may be more expensive than others. You may want to learn a cheaper ability first (within the tier), and then learn the ability you want to keep for half the blessing price. Neomail me if you have any questions or left something out, thank you. Since there are a variety of faeries, different blessings required and multiple potions to work with, here is a little more information about each of the faeries! I go into detail about their blessings, which abilities they are involved in, and each of their bottles. The Air Faerie is used the least in Aethia's Ability Academy so you may not need to obtain too many of these. Abilities Involved: Meditate, Meh, Throw Pillows, Float & Tempest. Out of all the elemental faeries, this seemed to always be the favorite from the majority of the people; however, similar to Air Faerie, not many abilities require Dark. There are a few decent abilities (more than Air), but not too many. Abilities Involved: Shade, Irritable Minions, Shroud, Warlock's Rage, Drain Life & Meepit Stampede. You may not be bothering the Earth Faerie in the beginning, but as you progress, you will be a frequent visitor! Very few abilities request her help initially; however, she is required for the entire Level 500 Tier which totals 180 blessings alone. Abilities Involved: Bandage, Shhhhhhhhh..., Shroud, Burrow, Tempest, Healing Fire, Meepit Stampede, Summon Monoceraptor & Esophagor Stench. There are very few abilities which require fire blessings but the total is so high because two abilities require a large amount. Abilities Involved: Cranky, Sear, Shroud, Warlock's Rage, Healing Fire, Rally Cry & Summon Monoceraptor. Probably the most popular faerie for the abilities. There are multiple powerful abilities which require a fair amount of light blessings. When abilities were first re-introduced, the weak bottles skyrocketed in price. The one positive aspect is she is not required in the Level 500 Tier. Abilities Involved: Positive Thinking, Lens Flare (Powerful), Float, Burrow, Snowager's Breath, Rejuvenate (Powerful) & Reflect. You will be a frequent visitor of the Water Faerie throughout training since she has the highest amount of blessings required by the abilities. It is up to you if you wish to obtain her abilities, but she is involved in many of them. Abilities Involved: An Icicle, Float, Snowager's Breath, Rejuvenate, Drain Life, Adrenaline Rush & Esophagor Stench. Special Note: This faerie bottle has the ability to bless your pet with 1-2 of any random faerie. It could be two of the same faerie, two different faeries or just one. How do I bless my pet? There are a variety of methods to obtain these bottled faeries. Please read up on "The Basics" portion of this guide for an In-Depth look at that information. What happened to our old abilities? They are no longer active or useful. You are unable to use them in the new battledome nor do they transfer over to help with the new abilities - You must start new. Yes they do - Any blessings required for an ability learned will be removed from the total amount that you have. They do not disappear unless you decide to change out an ability in your Tier. If you currently have Bandage activated and switch to Shade, you will lose your Bandage ability. You will be able to activate Bandage again but you have to pay. The price will be half what you originally paid though. What happens to my abilities if I met the level requirement but then fall below? You will still own the ability (since you paid for it), but you can no longer use it. Once you get back up to that level, it'll be available for use again. Can I use all abilities or just a certain amount? You are able to use one ability from each Level Tier (1, 5, 10, 25, 50, 100, 200, 300, 400, 500) at a time in battle (which gives you a total of ten different abilities to use at max level). You cannot have two abilities from the same Tier activated. Do I have to start training abilities from the beginning? You are able to freely train around all Tiers (as long as your pet has the required level). You do not have to start with Level 1 - You can learn Level 100 first, go down to Level 25 next and follow up with Level 200 if you wish! Will you be able to keep the abilities forever? You can keep them as long as you wish using them over and over. This changes if you decide to switch to another ability in the same level tier. For example, if you switch from Lens Flare to Throw Pillow, you will have to re-learn Lens Flare with Faerie Blessings. A positive note is that it will cost you half of the amount then the original. Are there any cheaper methods or secrets to obtaining abilities? There are no true secrets to obtain them; however, there is a small method which may help you save a little NP. Remember that once you learn an ability in a Tier, all of the others will decrease in blessing requirements. This can come in handy since certain bottled faeries may be more expensive than others. You may want to learn a cheaper ability first (within the tier), and then learn the ability you want to keep for half the blessing price. Below are the Faerie Abilities and their power. This page is always being updated with new information and statistics so please come back frequently. Also make sure to check the updates section for new information added. Here are a few abbreviations again to remind you what they mean. OPD: Once per Day - You are only able to use the ability once a day (they reset at midnight). In addition, you cannot switch abilities learned after you use it. You may only switch an active OPD ability before you use it for the day. 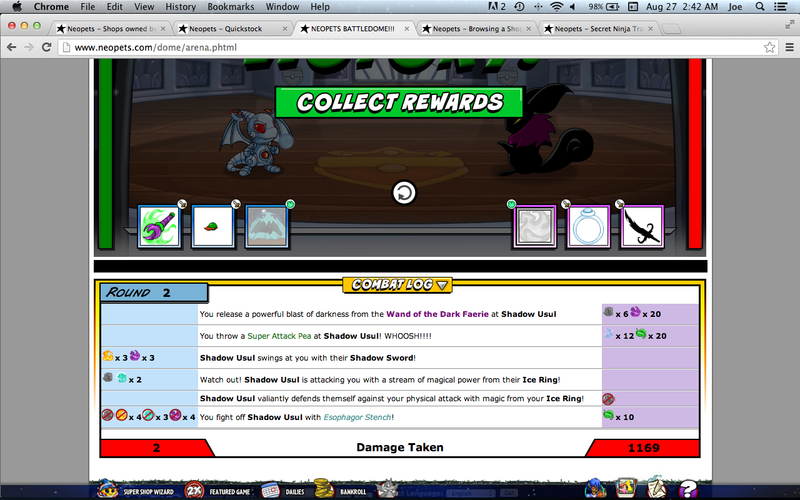 OPB: Once per Battle - You can only use the ability once in each battle you fight. CD: Cooldown - The ability needs a certain number of rounds to rest before it can be used again. PC: Pairing Capable - Certain abilities are delayed in dealing damage for one round. After you "activate"/use them in battle, you are able to choose any ability to use the following round. Doing this will allow you to have both abilities take effect. LPC: Limited Pairing Capable - Other abilities will deal damage for consecutive turns. When this occurs you are able to pair any defensive ability (identical method listed above). If you decide to use an offensive ability for the second round, then it will give your consecutive dealing ability a skip for that round and your second ability will work instead. If you decide to repeat that, then the consecutive ability will go into cool down mode or disable. Also, each ability will be rated & reviewed so please make sure to read. Abilities are rated from 1 to 5 along with an overall review. If you have any questions, please neomail me, thank you. Hit your opponent with a blast of light damage. Aethia's Ability Academy is not responsible for any resulting electrical charge. Review This is the best ability in this tier since you are getting 3 constant icons each round (without any cool down time). It may just be the little you need to one up your opponent. Attack your opponent with earth damage... this kind of thing does tend to linger. Review: This is the worst ability in the entry tier. You get a total of 4 icons in 2 rounds total (and then have to wait one round for cool down). Pick one of the other two to have in this tier. Drizzle: (CD: 1 Round & PC). Controlling the weather takes some time, but the extra water damage could be worth it. Review: This can and will be easily overlooked; however, you should do a double take! If you only have one or two abilities, then Static Cling may be best. If you do have a variety of them, chances are you have a better multi use than Cling and you dont need it. In which case you could use Drizzle for Round 1 and then use another constant (IE: An icicle) for Round 2 and you will deal damage from both abilities (Drizzle & Icicle) together! Special Note: Damage is dealt on the second round instead of the round you use it. Heal yourself for a few hit points. Every little bit helps, wouldn't you say? Review: If this was not once per battle, this may be helpful for beginner. Unfortunately that is not the case - This is not worth being in your active abilities. The HP heal is too low and not usable enough to justify keeping it. Meditate: 4 HP with a chance of healing the following round (CD: 4 Rounds). With a little focus, your healing can last a bit longer. Review: Similar to Bandage except this has a chance of healing again the following round. In order to receive the healing, you must place your move before your opponent does. Overall this is quite a useless ability; however, if you happen to enjoy L97 battling, this could prove to be helpful. The multiple healing aspect could be the difference between a win or loss. 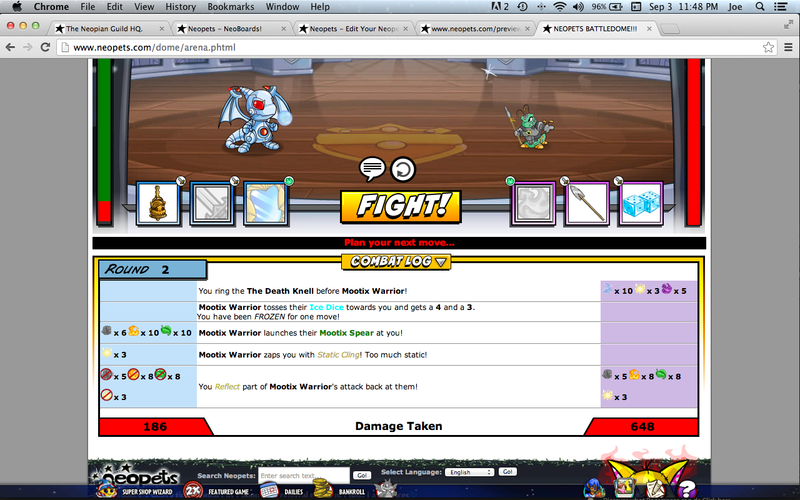 Special Note: Out of 40 Battles, 20 of them had this ability re-heal the following round in 1-Player battles. In 2-Player, you must submit your move before your opponent. Note that it may show a heal in the log, you may not have actually healed. Use this ability to slip into the shadows and protect yourself. Review: This is the best ability to have in this tier. Since the amount of icons blocked goes off your opponents defense, this will be great for those pets with lower defenses. Keep in mind of the CD period; however, this is the one you should keep active. Special Notes: At the moment this ability does not seem to be blocking dark icons. You wield your weapons with a bit more force while perturbed. Review: This ability has a nice concept; however, the percentage is just so low. There are other constant abilities available that will deal more damage. The one positive about this ability is you cannot block it. It does not directly deal icons - It strictly increases your damage by 5%. Your lethargy seems contagious and your opponent's enthusiasm drains. Review: Similar to cranky, the concept behind this ability is smart but the percentage is very low. The one positive about this ability is you dont have to worry about blocking the correct icons. No matter which icons are used, you will remove 5% of their total damage to you. The power of positive thinking grants you a bonus to healing. Review: Being able to heal 5% can be helpful if you have a high HP pet or for certain lower league battles. With this being once per battle, it really limits the power. 5% is such a low rate (Ex: You need 2000 HP to heal 100 HP). Overall, this may be your best option to have in this tier as none of them are extremely useful. It never hurts to have a spare healing ability though. 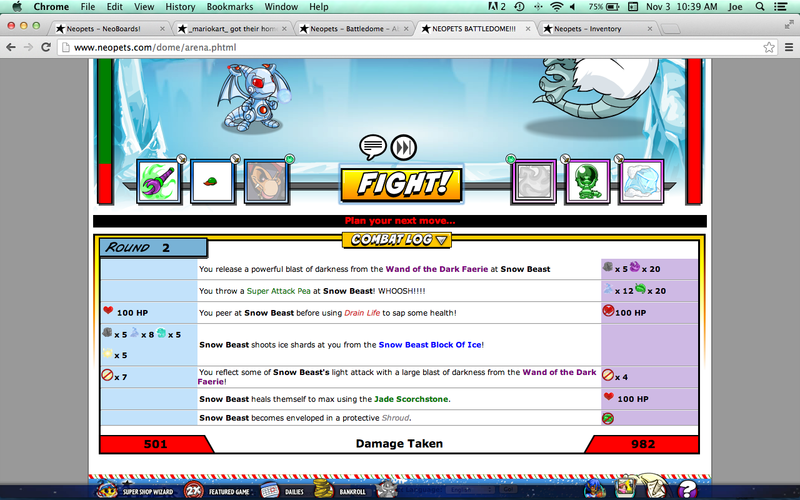 Special Note: This ability used to mirror damage; however, Neopets Team has removed this power. Frozen water can be quite devastating in battle. Review: This ability is like a mini third constant. Being able to use your weapons with an additional 6 icons may be the push you need to defeat your opponent (especially water icons). What shines in this ability is the multi-use capability. Overall this is probably the best option to have in this tier. Sear: for two consecutive rounds (CD: 1 Round & LPC). Inflict fire damage upon your opponent. It takes a while to put it out. Review: Being able to deal four fire icons (one of the hardest to block) for round one is okay. Where this shines is being limited pairing capable! You are able to use an additional ability with this. The second round will still provide you four fire icons and whichever other ability you decide to use (Read the LPC definition at the top for more information). Summon your dark minions to attack your opponent... eventually. Review: Having the ability to deal eight extra dark icons is beneficial but not as much with a 10 round cool down rate. There is a spot for this to be helpful though. As long as you dont expect or need this constantly, surprising your opponent with eight dark icons (especially if you dont have dark in your set) can really give you an edge. This is certainly not the worst ability; however, make sure you have at least one "mini-constant" ability that is multi-use. This works identical to "Drizzle" with using an additional ability for the second round. Special Note: Damage is dealt on the second round instead of the round you use it. It is important to mention that this ability is currently not dealing out the damager per icon as it should. Once this is fixed, I will update this information. Throw Pillows: Disables your opponents weapons (OPD). Use these to let your opponent know it's nap time. Review: Aside from the fact that this is a once per day ability (which is horrible), this is identical to Lens Flare, which is in the same tier. There is no justification why you would use this in battle. Ignore this ability and move on. Special Note: When opponent uses a OPB weapon into a lens flare (IE: Ghostkerbomb), the weapon is not consumed and they will be able to use it later in the fight. Lens Flare: Disables your opponents weapons & abilities (OPB). Blind your opponent with this lens flare and they won't be able to see their weapons. Review: One of the best abilities available for your pets. The only weapons that are capable of doing this are Thyoras Tear (worth many millions) and Thick Smoke Bomb (Single Use). Make sure you add this to your list! Silence your opponent. It's hard to cast spells when you can't speak. Review: This is certainly an ability with a unique power. Being able to disable your opponents ability can be extremely beneficial (if timed right). Of course it could fail if they dont use one; however, with so many useful abilities, chances are they will. If you do decide to use this as your active (and not have Lens Flare), you can still use "Warlock's Rage" on Tier Level 200 since it is the same ability as Lens Flare. Keep an eye out for this one being used! Special Notes: We notice this works against all abilities except Lens Flare & Warlocks Rage. Increase your resistance to dark, fire, and earth. Increase your resistance to light, water, and air. Review: Even though air is a commonly used icon, the defense of this ability is not strong enough to justify having it active. Using this when Sword of Ari is received will result in blocking only 3.125 icons (15/4.8). 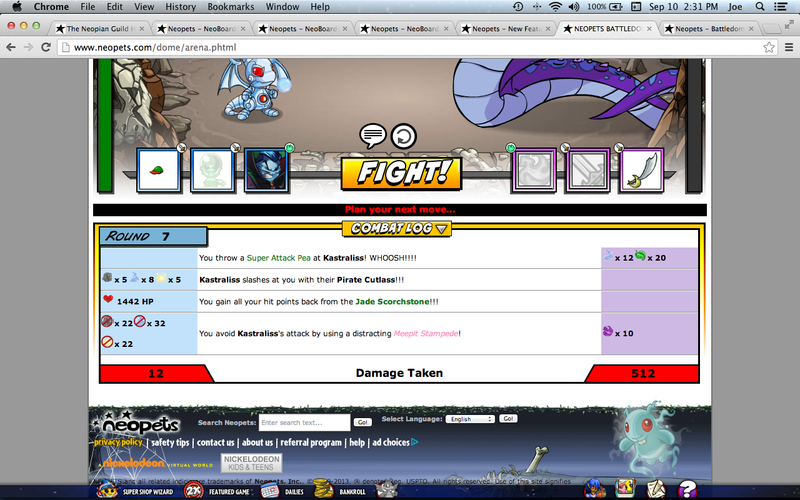 Unless Neopets Team changes this ability, ignore it! Special Notes: In order to know how much it will block, you must divide the total light, water & air icons by 4.8. The result will be how many icons are blocked. Please remember that this ability (as with any of them while in Beta) is subject to change at Neopets Team discretion. Hide from your opponent safely underground. Review: At the moment, this does seem to be the best choice since the other two abilities do not fully block any icon types. Although it is different than the old burrow, it is capable of being one of the best defensive abilities available to us. Special Notes: This will randomly block 100% of 3 different types of icons. The current issue involves darkness not being blocked. It will try to block it; however, it is never successful. Please remember that this ability (as with any of them while in Beta) is subject to change at Neopets Team discretion. Send your opponents to the eye of the storm and see how long it takes them to get out. Review: This seems to be an upgrade to Lens Flare since it disables your opponents weapons with an additional 6 icons (currently the damage is not dealt though). Regardless, this is only once per day, so do not waste your blessings on this. Special Notes: The last time this was tested, the icons were not dealing any damage although they appeared in the battle log. Note: Once you purchase another ability in this Tier, it seems the air & earth switch and you will need more earth than air. Create a very thick, icy prison around your opponent... as long as it doesn't miss, that is. Review: Considering the variety of other abilities available, this is one of the worst. Its a shame because I think it sounds powerful and strong to use. This is another once per day ability and its not even 100% chance to freeze. Dont give this a second thought as it is not worth your time. Special Notes: Additional testing would be beneficial to get better percentage. Warlock's Rage: Disables your opponents weapons & abilities (OPB). Channel your malevolent rage into increased damage and incapacitate your opponent at the same time. A favourite combo of warlocks everywhere. Review: This is identical to the ability "Lens Flare" and most are confused as to why there would be two identical abilities...but it currently looks that way. With that in mind, this is the best ability in this tier without question. Use this before or after Lens Flare in battle and you will have two consecutive rounds of avoiding damage. Special Note: When opponent uses a OPB weapon into a Warlock's Rage (IE: Ghostkerbomb), the weapon is not consumed and they will be able to use it later in the fight. Cleanse with the power of fire! Review: This is the worst ability in this tier and I strongly suggest avoiding it. Healing 25 HP once per battle is worse than some of the lower tier abilities - Just not worth it. Rejuvenate: 100% or 5% of Max HP (OPB). Increase your healing power for a short period of time. Review: One of the requirements to do really well in battle is a full healer. This ability is extremely helpful to those who may not be able to afford a LEV or Jade SS; however, there are a few aspects regarding this ability which you need to know. In order for this to fully heal, you must be over 5% HP, you must be attacked on the round you use it & Lens Flare/Warlocks Rage cannot be used against you since they will stop this from being used (and you will be unable to try again the rest of the battle). While this is certainly nice to have as a backup, I would still strongly recommend having a full healing item which is more dependable. • You must have over 5% of your maximum HP to receive the full heal. • You must receive damage the same round you use Rejuvenate to receive the full heal. • Lens Flare/Warlocks Rage type abilities will disable Rejuvenate and you will lose the chance to use it for the battle. • Do not use this ability the round after a Lens Flare/Warlocks Rage ability is used as you will not receive any healing (although it may say you did). Steal your opponent's life force and add it to your own. Review: This is certainly a helpful ability to be able to drain and heal together. This has its obvious benefits; however, with being used once per battle, having a 100 HP cap, and being in the same tier as Rejuvenate, hard to pick this one to keep active. If you do not wish you have rejuvenate for a particular reason though, this is the second best option. Politely decline your opponents generous gifts. They can keep 'em. Review: This is certainly the best ability in this tier if you are lucky to achieve this high level. Being able to reflect 2/3's of your opponents damage back at them is quite strong (especially when you add two offensive items). Also keep in mind that it is extremely rare to come across weapons that block reflected icons. This is also extremely helpful when battling those highly powerful 1-player opponents. Why not have your opponent receive their own incredibly unjust damage?! Rally Cry: with a small chance of repeating up to two more consecutive rounds (OPB). The fire within you can't be extinguished and you use it freely against your opponent over the course of battle. Review: There is certainly a use for this ability if used correctly. Considering Fire is currently the hardest icon to block, this may come in handy. 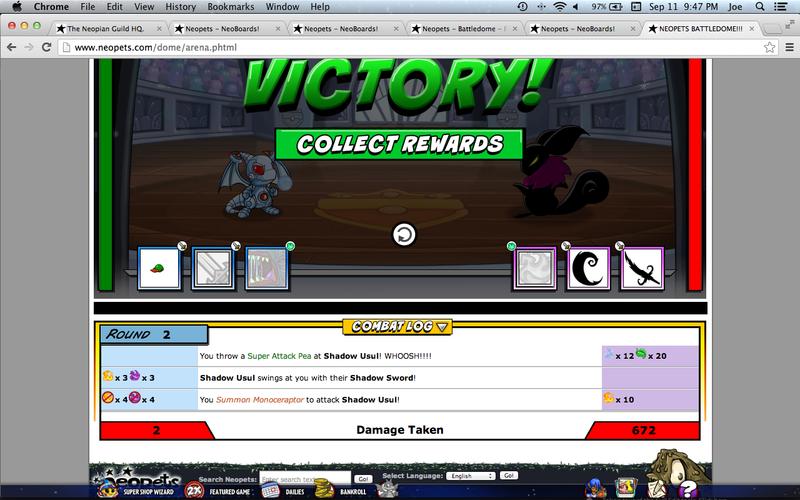 Being able to do three consecutive turns of fire damage can be what you need to defeat your opponent. Special Note: Round 1: Use Rally Cry. Round 2: If you use a different ability, there is a small chance Rally Cry's consecutive damage working. A rush of adrenaline makes you stronger and more agile. This is pretty useful if you like damaging your opponent. Review: This is just not worth it - While the concept is nice, the percentage is extremely too low (especially for such a high level). Look at the other two abilities for this tier because this is not worth the blessings. The dark power of a Meepit invasion is yours to control. It doesn't bode well for your opponents, or their damage output. Review: While this ability currently blocks 99% of all damage received, the damage output seems to have a problem. Even though it shows 10 dark icons being delivered, the damage is not dealt. This is expected to be fixed by The Neopets Team and I will update as soon as it is. The fiery Monoceraptor is at your command and can be used to distract your opponent. Just remember to stay out of the way. Review: Overall this is probably the best of the three abilities to have available (depending on your set). Technically all three of these abilities are identical with the exception of icon types. Earth and Dark icons are both very popular and easy within various leagues. Fire is your best option to avoid being blocked/reflected. Although if you happen to use weapons with heavy fire icons, one of the other abilities may work best to have variety. The earthy stench of the Esophagor, which can distract your opponents quite easily, is at your disposal. Disposal being the key word here. Review: It seems to block ~99% of the damage you receive which allows you to focus strictly on using damage dealing weapons. While this is currently a once per day ability, it can be quite useful if you save it for a strong opponent. Below you are able to see the variety of screenshots taken for this guide. Each of these are linked from above with the appropriate ability - Enjoy! If you do enjoy this page or find it helpful, please place a banner up!